The historical center of Thessaloniki, with monuments from the city's Hellenistic, Roman, Byzantine and Ottoman past. Macedonian-era crater at the Archaeological Museum of Thessaloniki. The city was founded around 315 BC by King Cassander of Macedon, on or near the site of the ancient town of Therma and twenty-six other local villages. King Cassander of Macedon named the new city after his wife Thessalonike, a half-sister of Alexander the Great. She gained her name ("victory of Thessalians", from Greek: nikē "victory") from her father, Philip II, to commemorate her birth on the day of his gaining a victory over the Phocians, who were defeated with the help of Thessalian horsemen, the best in Greece at that time. Thessaloniki developed rapidly and as early as the 2nd century BC, it had its first walls built, which enclosed and protected the city. The city also came to be an autonomous part of the Kingdom of Macedon, with its own parliament where a King was represented that could interfere in the city's domestic affairs. The Roman Forum in central Thessaloniki. After the fall of the Kingdom of Macedon in 168 BC, Thessalonica as it came to be called in Latin, became a city of the Roman Republic. It grew to be an important trade-hub located on the Via Egnatia, the Roman road connecting Byzantium (later Constantinople) with Dyrrhachium (now Durrës in Albania), which facilitated trade between Europe and Asia. The city became the capital of one of the four Roman districts of Macedonia while it kept its privileges but was ruled by a praetor and had a Roman garrison. Also for a short time in the 1st century BC, Thessalonica even became capital for all the Greek provinces. Due to the city's key commercial importance, a spacious harbour was built by the Romans, the famous Burrowed Harbour (Σκαπτός Λιμήν) that accommodated the city's trade, up to the 18th century. Later, with the help of silt deposits from the Axios river, land was reclaimed and the port was expanded. Remnants of the old harbour's docks can be found in present-day under Frangon Street, near the city's Catholic Church. Thessaloniki's acropolis, located in the northern hills, was built in 55 BC for security reasons, following Thracian raids in the city's outskirts at the time. About 50 AD, while on his second missionary journey, Paul the Apostle reasoned with the Jews from the Scriptures in this city's chief synagogue on three Sabbaths and sowed the seeds for Thessaloniki's first Christian church. During Paul's time in the city, both Jews and Greeks came to believe the Gospel, as well as some of the city's leading women. However, because the remaining Jews at the synagogue were furious with Paul for what he'd done in their community and were also furious with those who had come to believe Paul's message, the Apostle and his traveling companions, Silas and Timothy, were eventually sent out of Thessaloniki during the night by the new Christian converts. From there the church planters went to Veroia, aka Berea, where the people in that city also heard and believed the Gospel. This so enraged the Thessalonian Jews when they found out what Paul and his companions had done, the Jews went to Berea and persecuted the evangelists in that city also. The three men eventually continued their travels and ministry; and, Paul wrote two letters to the new church at Thessaloniki, probably between 51 and 53, the First Epistle to the Thessalonians and the Second Epistle to the Thessalonians. These letters were to encourage the new believers to persist in the faith in the face of strong opposition, to encourage personal sanctification, to encourage them about those who had "fallen asleep," yet to warn about the Lord returning as a "thief in the night" and to correct incorrect thinking about the coming Antichrist, among writing about other important matters. The Church of Hagios Demetrios, patron saint of the city. The Church of Holy Wisdom (Αγία Σοφία - Hagia Sophia) in central Thessaloniki. Theodorus Gaza, also called by the epithet Thessalonicensis (Latin) and Thessalonikeus (Greek), was a humanist and translator of Aristotle. When the Roman Prefecture of Illyricum was divided between the East and West Roman Empires in 379, Thessaloniki became the capital of the new Prefecture of Illyricum (reduced in size). Its importance was second only to Constantinople itself, while in 390 it was the location of a revolt against the emperor Theodosius I and his Gothic mercenaries. Butheric, their general, together with several of his high officials, were killed in an uprising triggered by the imprisoning of a favorite local charioteer for pederasty with one of Butheric's slave boys. 7,000 - 15,000 of the citizens were massacred in the city's hippodrome in revenge – an act which earned Theodosius a temporary excommunication. A quiet interlude followed until repeated barbarian invasions after the fall of the Roman Empire, while a catastrophic earthquake severely damaged the city in 620, resulting in the destruction of the Roman Forum and several other public buildings. Thessaloniki itself came under attack from Slavs in the 7th century (most notably in 617 and 676–678); however, they failed to capture the city. Byzantine brothers Saint Cyril and Saint Methodius were born in Thessaloniki and it was Byzantine Emperor Michael III who encouraged them to visit the northern regions as missionaries where they adopted the South Slavonic speech as the basis for the Old Church Slavonic language. In the 9th century, the Byzantines decided to move the market for Bulgarian goods from Constantinople to Thessaloniki. Tsar Simeon I of Bulgaria subsequently invaded Thrace, defeated a Byzantine army and forced the empire to move the market back to Constantinople. In 904, Saracens, led by Leo of Tripoli, managed to seize the city and after a ten-day depredation, left after having freed 4,000 Muslim prisoners while capturing 60 ships, and gaining a large loot and 22,000 slaves, mostly young people. Following these events, the city recovered and the gradual restoration of Byzantine power during the 10th, 11th, and 12th centuries brought peace to the area. As the population of the city expanded, according to Benjamin of Tudela, a Jewish community of some 500-strong was also established in the 12th century. During that time the city came to host the fair of Saint Demetrius every October, which was held just outside the city walls and lasted six days. The economic expansion of the city continued throughout the 12th century as the rule of the Komnenoi emperors expanded Byzantine control into Serbia and Hungary, to the north. The city is known to have housed an imperial mint at this time. However, after the death of the emperor Manuel I Komnenos in 1180, the fortunes of the Byzantine Empire began to decline and in 1185, Norman rulers of Sicily, under the leadership of Count Baldwin and Riccardo d'Acerra, attacked and occupied the city, resulting in considerable destruction. Nonetheless, their rule lasted less than a year and they were defeated by the Byzantine army in two battles months later, forcing them to evacuate the city. Coat of Arms of Kingdom of Thessalonica (1204–1224). In the 14th century, however, the city faced upheaval in the form of the Zealot social movement (1342–1349), springing from a religious conflict between bishop Gregory Palamas, who supported conservative principles, and the monk Barlaam. Quickly, it turned into a political anti-aristocratic movement during the Byzantine civil war of 1341–47, leading to the Zealots ruling the city from 1342 until 1349. Historic map of Thessaloniki by Piri Reis. The Byzantine Empire, unable to hold the city against the Ottoman Empire's advance, handed it over in 1423 to the Republic of Venice. Venice held the city until it was captured after a three-day-long siege by the Ottoman Sultan Murad II, on 29 March 1430. The Ottomans had previously captured Thessaloniki in 1387, but lost it in the aftermath of their defeat in the Battle of Ankara against Tamerlane in 1402, when the weakened Ottomans were forced to hand back a number of territories to the Byzantines. During the Ottoman period, the city's Muslim and Jewish population grew. By 1478, Thessaloniki had a population of 4,320 Muslims between 6,094 Greek Orthodox inhabitants. By c. 1500, the numbers of Muslims grew to 8,575 Muslims, with Greeks numbering at 7,986, making them a minority. Around the same time, Jews began arriving from Spain, fleeing persecution. In c. 1500, there were only 3,770 Jews, but by 1519, 15,715 Jews came to form 54% of the city's population. The invitation of the Sephardic Jew's expelled from Spain by Ferdinand and Isabella, was an Ottoman demographic strategy aiming to prevent the Greek population from dominating the city, as it had in previous years. Sephardic Jews, Muslims and Greek Orthodox remained the principal groups in the city for the next 400 years. The city came to become the largest Jewish city in the world and remained as such for at least 200 years, often called "Mother of Israel". Of its 130,000 inhabitants at the start of the 20th century, around 60,000 were Sephardic Jews. Some Romaniote Jews were also present. Thessaloníki, called Selânik in Turkish, became one of the most important cities in the Empire, viable as the foremost trade and commercial center in the Balkans. The railway reached the city in 1888 and new modern port facilities were built in 1896-1904. The founder of modern Turkey, Mustafa Kemal Atatürk, was born there in 1881, and the Young Turk movement was headquartered in the city in the early 20th century. View of the Yeni (New) Mosque, built during the late Ottoman period. Selânik was a sanjak center (Sanjak of Selanik) in the Rumeli Eyalet from 1393 to 1402 and again from 1430 to 1826, when it became center of a separate province, the Selanik Eyalet. From 1867 it was transformed into the Selanik Vilayet, which included the sanjaks of Selânik (Thessaloniki), Drama, and Serres (Siroz or Serez). Architectural remains from the Ottoman period can be found mainly in the city's Ano Poli (Upper Town) district, in which traditional wooden houses and fountains survive the city's great fire in the following years. In the city center, a number of the stone mosques survived, notably the Hamza Bey Mosque on Egnatia (under restoration), the Aladja Imaret Mosque on Kassandrou Street, the Bezesten (covered market) on Venizelou Street, and Yahudi Hamam on Frangon Street. Most of the more than 40 minarets were demolished after 1912, or collapsed due to the Great Thessaloniki Fire of 1917; the only surviving one is at the Rotonda (Arch and Tomb of Galerius). There are also a few remaining Ottoman hammams (bathhouses), particularly the Bey Hamam on Egnatia Avenue. After the outbreak of the Greek War of Independence, a revolt took place also in Macedonia, under the leadership of Emmanouel Pappas, which finally established in Chalkidiki peninsula. In May 1821 the governor of Thessaloniki Yusuf Bey (son of Ismail Bey) ordered to kill any Greeks found in the streets. The Mulla of Thessalonica, Hayrıülah, gives the following description of Yusuf's retaliations: "Every day and every night you hear nothing in the streets of Thessaloniki but shouting and moaning. It seems that Yusuf Bey, the Yeniceri Agasi, the Subaşı, the hocas and the ulemas have all gone raving mad". From 1870, driven by economic growth, the city's population exploded by 70%, reaching 135,000 in 1917. During the 19th century, Thessaloníki became one of the cultural and political centres of the Bulgarian revival movement in Macedonia. According to Bulgarian ethnographer Vasil Kanchov around the beginning of the 20th century there were approximately 10,000 Bulgarians, forming a substantial minority in the city. In 1880 a Bulgarian Men's High School was founded, followed later by other educational institutions of the Bulgarian Exarchate. In 1893 a part of the Bulgarian intelligentsia created a revolutionary organization, which spread its influence among Bulgarians throughout Ottoman Balkans and became the strongest Bulgarian paramilitary movement, best known under its latest name, the Internal Macedonian Revolutionary Organization (IMRO). In 1903 a group of Bulgarian leftists and anarchists, tied to IMRO, organized series of Thessaloniki bombings of 1903. After the Young Turk Revolution of 1908, Thessaloniki became a centre of Bulgarian political activity in the Ottoman Empire and seat of the two largest legal Bulgarian parties, the rightist Union of the Bulgarian Constitutional Clubs, and the leftist People's Federative Party (Bulgarian Section). The "Triumvirate of National Defence" in Thessaloniki, autumn 1916. 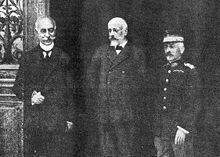 L-R: Admiral Pavlos Kountouriotis, Prime Minister Eleftherios Venizelos and General Panagiotis Danglis. Map showing the area, covering most of the city's historical center, destroyed by the 1917 fire. During the First Balkan War, the Ottoman garrison surrendered Salonika to the Greek Army, on 9 November [O.S. 27 October] 1912. This was a day after the feast of the city's patron saint, Saint Demetrios, which has become the date customarily celebrated as the anniversary of the city's liberation. The next day, a Bulgarian division arrived, and Bulgarian troops were allowed to enter the city in limited numbers. Although officially governed by the Greeks, the final fate of the city hung in the balance. The Austrian government proposed to make Salonika into a neutral, internationalized city similar to what Danzig was to later become; it would have had a territory of 400–460 km² and a population of 260,000. It would be "neither Greek, Bulgarian nor Turkish, but Jewish". The Greeks' emotional commitment to the city was increased when King George I of Greece, who had settled there to emphasize Greece's possession of it, was assassinated on 18 March 1913 by Alexandros Schinas. After the Greek and Serbian victory in the Second Balkan War, which broke out among the former allies over the final territorial dispositions, the city's status was finally settled by the Treaty of Bucharest on August 10, 1913, sealing the city as an integral part of Greece. In 1915, during World War I, a large Allied expeditionary force landed at Thessaloniki to use the city as the base for a massive offensive against pro-German Bulgaria. This precipitated the political conflict between the pro-Allied Prime Minister, Eleftherios Venizelos and the pro-neutral King Constantine. In 1916, pro-Venizelist army officers, with the support of the Allies, launched an uprising, which resulted in the establishment of a pro-Allied temporary government (the "Provisional Government of National Defence"), headed by Venizelos, that controlled northern Greece and the Aegean, against the official government of the King in Athens. Ever since, Thessaloniki has been dubbed as symprotévousa ("co-capital"). On 18 August [O.S. 5 August] 1917, the city faced one of it most destructive events, where most of the city was destroyed by a single fire accidentally sparked by French soldiers in encampments in the city. The fire left some 72,000 homeless, many of them Jewish, of a population of approximately 271,157 at the time. Venizelos forbade the reconstruction of the town center until a full modern city plan was prepared. This was accomplished a few years later by French architect and archeologist Ernest Hebrard. The Hebrard plan, although never fully completed, swept away the oriental features of Thessaloníki and transformed it into the modern European metropolis that it is today. One effect of the great fire, came to be dubbed the Great Thessaloniki Fire of 1917, was that nearly half of the city's Jewish homes and livelihoods were destroyed, leading to massive Jewish emigration. Many went to Palestine, others to Paris, while others found their way to the United States (among them some ancestors of the actress Lea Michele). Their populations, however, were quickly replaced by considerable numbers of Greek refugees from Asia Minor as a result of the population exchange between Greece and Turkey, following the defeat of the Greek forces in Anatolia during the Greco-Turkish War. With the arrival of these new refugees, the city expanded enormously and haphazardly. These events made the city to be nicknamed "The Refugee Capital" (I Protévousa ton Prosfýgon) and "Mother of the Poor" (Ftokhomána). Registration of the Jews of Thessaloniki by the Nazis, July 1942. On 20 June 1978, the city was hit by a powerful earthquake, registering a moment magnitude of 6.5. The tremor caused considerable damage to several buildings and even to some of the city's Byzantine monuments; forty people were crushed to death when an entire apartment block collapsed in the central Hippodromio district. Nonetheless, the large city recovered with considerable speed from the effects of the disaster. Early Christian and Byzantine monuments of Thessaloniki were inscribed on the UNESCO World Heritage list in 1988 and Thessaloniki later became European City of Culture in 1997. Nikis Avenue on Thessaloniki's seafront. In June 2003, the city was host to the Summit meeting of European leaders, at the end of the Greek Presidency of the EU, with the summit taking place at the Porto Carras resort in Chalkidiki, to aid security precautions. In 2004 the city hosted a number of the football events forming part of the 2004 Summer Olympic Games and experienced a massive modernisation program. Thessaloniki unsuccessfully bid for the 2008 World EXPO, this time won by Zaragoza in Spain, but another planned bid for 2017 was announced in September 2006 and is now in full development. ^ Васил Кънчов (1970). "Избрани произведения", Том II, "Македония. Етнография и статистика" (in Bulgarian). София: Издателство "Наука и изкуство". p. 440. ^ Mercia MacDermott (1988). For Freedom and Perfection. The Life of Yané Sandansky. London: Journeyman. p. chapters "Plus ça change, plus c'est le même" and "Uneasy peace". Retrieved 2007-10-19. Vassilikou, Maria. "Greeks and Jews in Salonika and Odessa: Inter-ethnic Relations in Cosmopolitan Port Cities." Jewish Culture and History 4.2 (2001): 155-172. Wikimedia Commons has media related to History of Thessaloniki. This page was last edited on 31 January 2019, at 13:02 (UTC).